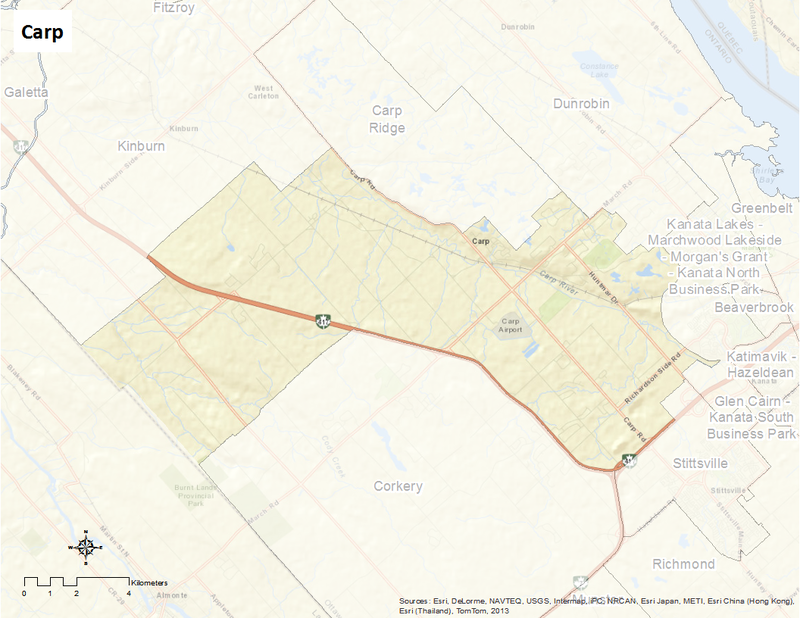 Carp is bounded by Thomas A. Dolan Parkway to the north, March Road to the south, Upper Dwyer Hill Road to the east and the Ottawa River to the west. Carp, a village to the west of Ottawa, was named after the Carp River that runs through the majority of the area. This river initially took its name due to the overwhelming amount of the carp fish that lived within it (fish said by early French explorers to be suckers and mud-pout, that in French translate as carpe.) The main street was formerly a section of the Trans-Canada Highway and carried much of the traffic coming from the west into Ottawa; the village was bypassed with the development of the Highway 417. Carp is renowned the Diefenbunker, now Canada’s Cold War museum located just north of the village, and formerly a top-secret underground bunker built to house key members of the government in the event of a nuclear attack on Ottawa. Carp is also home to the corporate HQ of Canadian Space Services which occupies the former site of a satellite communications station that provided communications between all NATO countries, 1960-1999. The Carp Exhibit Hall, red-painted with white trim, is one of the few remaining octagonal frame fairground buildings in Ontario and continues to function as the main fairground hall for the Carp Fair held in September each year since 1880 and hosts the popular Carp Farmers’ Market held each Saturday (May to October). With the amalgamation of municipal governments in the region in 2001, Carp is now governed as part of the new City of Ottawa. Carp is used as a mailing address for most of the former Huntley Township. As such, residents of this large area will identify themselves as living in Carp although they may live far from the village proper. Here’s an infographic that describes Carp as a Village of 100 (2011 data).